A restroom is an extremely important component of any home. It must be all-inclusive – comprising comfort, convenience, functionality and nice design, of course. However, in real life we seldom care about the aesthetical aspect of our toilets. 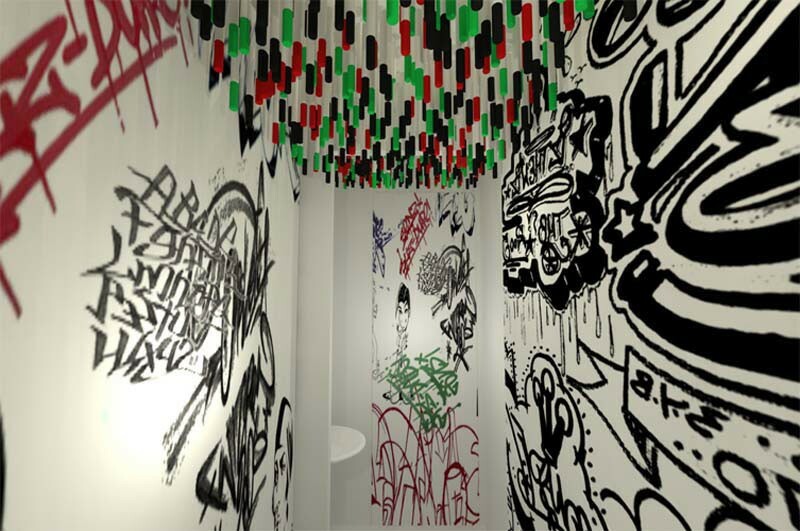 That’s why today we decided to show you 5 non-standard restroom designs with peculiar décor, which will inspire you to do something special about the room with the highest traffic. If being a kid you constantly had to hold yourself back not to leave a note on the toilet wall for the next visitors or for a kind cleaning lady, we’re glad to announce that today your teenage dream may come true. 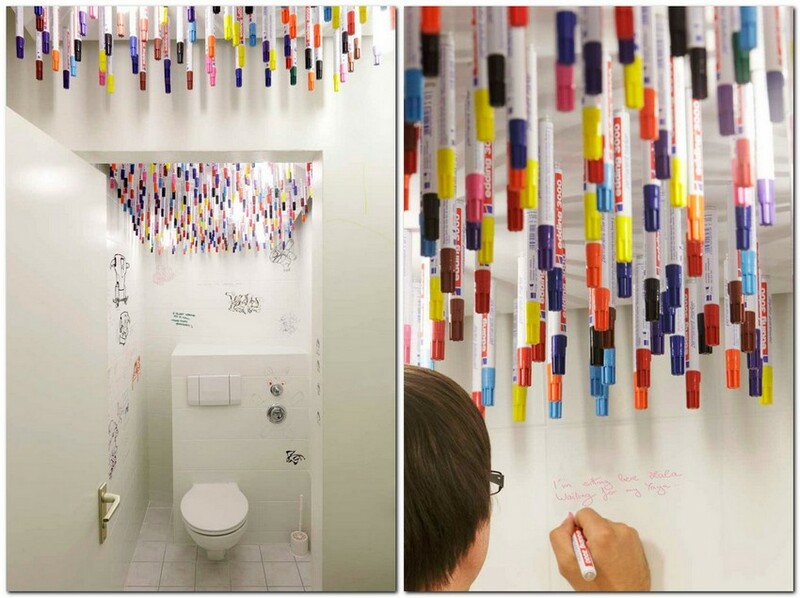 The thing is that a famous German interior design studio Tulp has created a restroom with numerous marker pens attached to the ceiling with magnets. So, now you can safely write and draw anything to your liking on the restroom walls and it won’t be reviewed as a barbaric act. And you can find a pen friend not just from the Internet! This restroom is literally fulfilled with dozens of mirrors of versatile sizes and shapes. And its interior is purely snow white, which adds even more spice to it. One of the biggest European advertising agencies Webguerillas spent loads of time and effort to get such a mirror kingdom. But it’s definitely worth seeing. 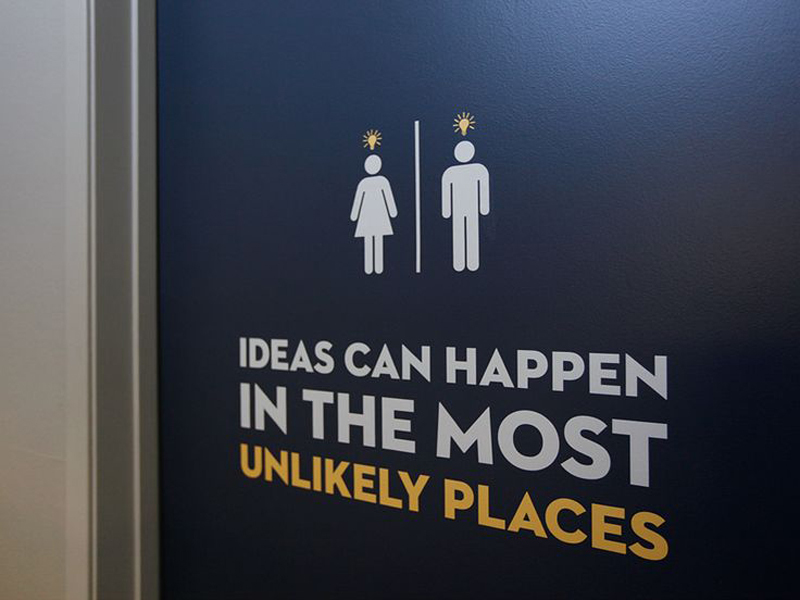 Do you know, what is the most frequent question coming to the minds of public WC visitors? No, it’s not about what the sense of life is. 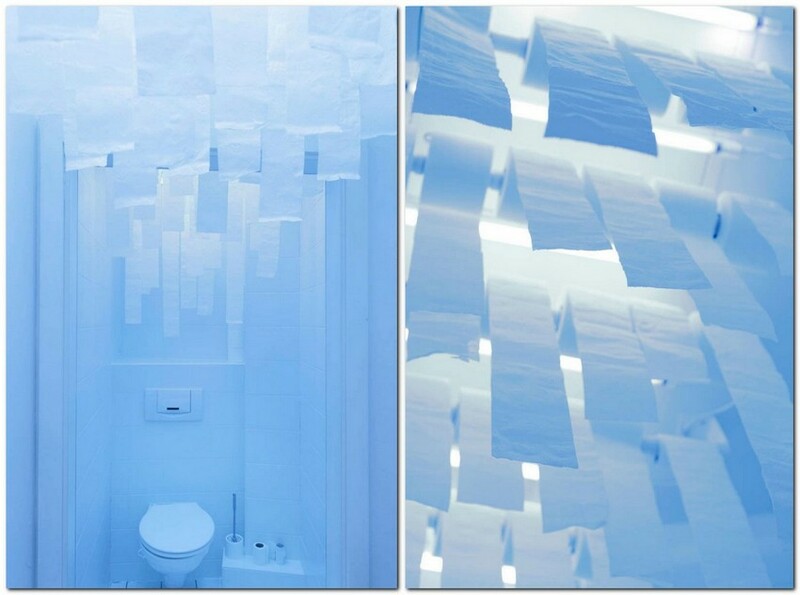 The answer is quite trivial – “is there a roll of toilet paper here?” German designers from the above-mentioned Tulp studio knew it and this inspired them to create such a restroom interior design, which would make people think about more serious and sublime issues. Here you will feel like in a paper kingdom. One more important element of this interior is the correct lighting. Pale blue, almost lapis blue and soft, and coupled with the right wall color, it’s completely relaxing and soothing. Office employees are surely glad about having such a cozy nook. 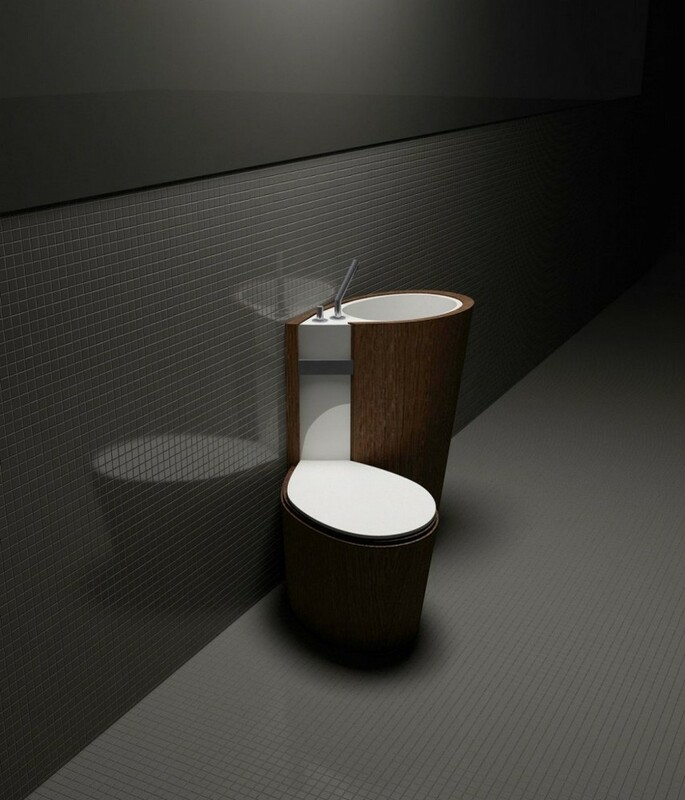 Russian interior design studio “Za bor” has introduced a super functional model of sanitary porcelain, which combines a toilet bowl and a wash basin in one piece. The secret is that this invention suggests using the so-called gray water (i.e. water produced in the process of hand washing or taking a shower) to flush the toilet. It’s “Za bor” again and another hybrid model. 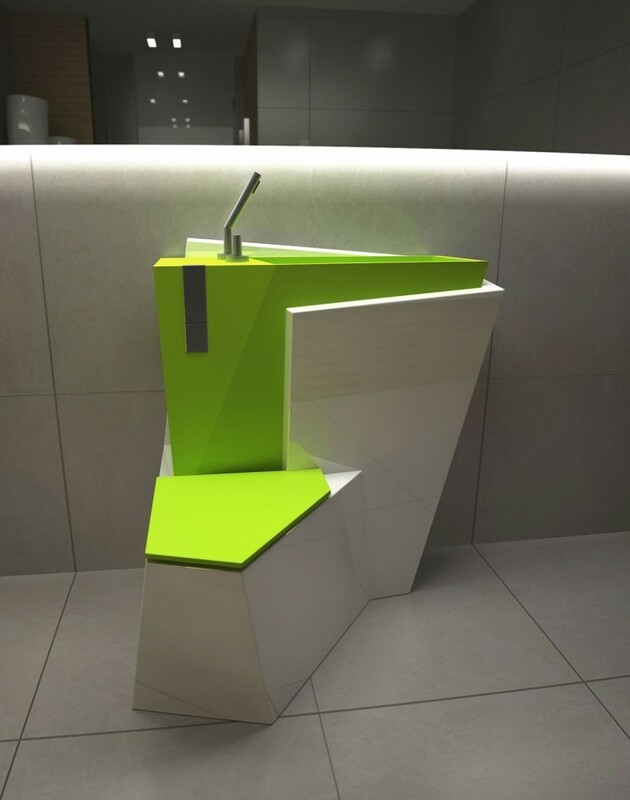 The designers decided to develop the idea of multifunctionality further, and developed a design, which combines original geometry and splendid color mixture – white and acid green, making the model a true designer masterpiece.